Whiteboards are something you see in many different workplaces, from offices to hospitals. But in an ever-changing world of interior design, do they still have a place upon your walls? Big bulky frames and hard to remove stains will probably leave you feeling firmly against them. As we said, interior design is constantly changing, and with it, places like Glasslab work hard to create stunning pieces of modern glass furniture. But how can you make a whiteboard look sleek and fitting for the 21st century. Well, this is where glass whiteboards come in. A glass whiteboard says goodbye to frames, stains and discolouring, while remaining just as functional as ever. You may be thinking “just as functional? But glass isn’t magnetic?”. Well, you can still use magnets to attach things to your glass whiteboard, as it’s made by bonding toughened glass to a steel back-plate. As well as retaining the magnetism, the steel plate also ensures support for the board, allowing you to safely lean on the writing surface, as you would while writing on a normal whiteboard. Also, so the writing surface is clear, and your ink is easily visible, the back of the glass is painted. 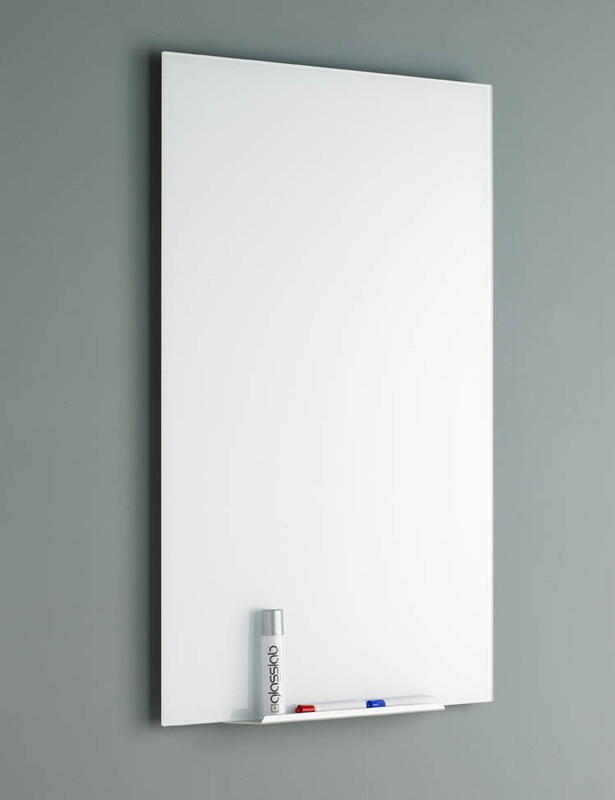 As with most Glasslab products, the glass whiteboard is available in several different styles. Firstly, the basic ‘standard glass’ model. 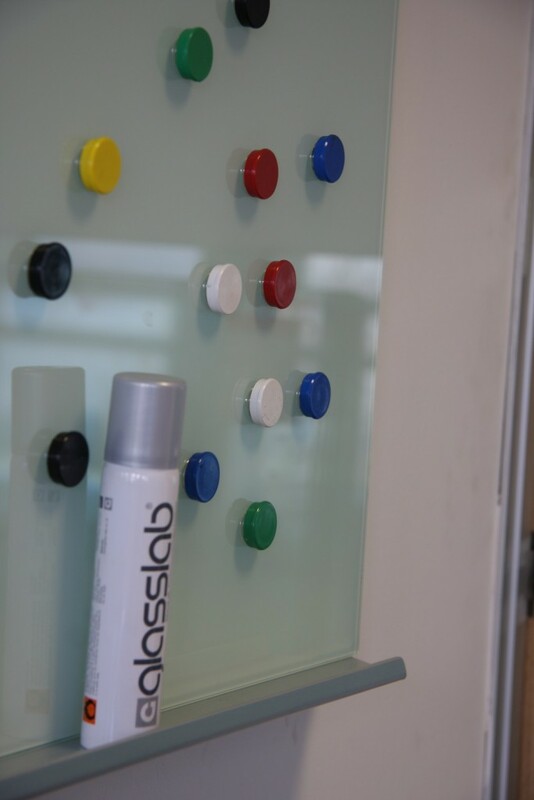 Compared to a normal whiteboard, it’s certainly “above standard”, but amongst our glass whiteboards, it’s the standard. This is because we don’t make any changes to it – the board retains a minty green tint, which is down to the iron content in the glass we use. But what if you want your whiteboard to actually be white? Well, the next item in our range is the ‘Pure White’ model. The only small difference here is the use of low-iron glass, but visually there’s a huge contrast between the two. As mentioned earlier, the back of the glass is painted white, and this shining white is transferred through the glass without the green tint. Also in our range is the ‘Anti-bacterial’ board. 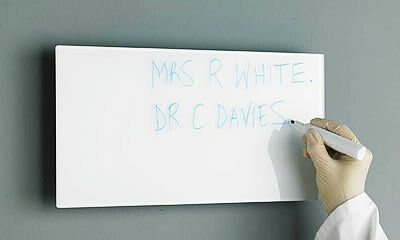 As we said earlier, whiteboards are commonly used in hospitals, so whether you want one in an operating theatre or in a laboratory, we can ensure they meeting clinical hygiene standards. So there are some of the glass whiteboard styles we make. But what if none of them suit your needs? Well, Glasslab’s bespoke design service can be extremely useful, and we’re open to any ideas you may have. Obviously, one of the main things we cater for with our bespoke service is size. We understand that “one size fits all” can’t apply to every workplace that wants a glass whiteboard, so we can make them to dimensions you require. As mentioned previously, we paint the back of the glass white, but if you have a unique workspace, or you’re looking for something to perfectly complement your modern office, we can paint the glass any colour you want. We also offer a printing service, as part of the bespoke package. Maybe you want your company logo printed onto the whiteboard? Or some patterning for the ultimate personal design? Well, we can do just that. If you’re looking for the whiteboard to be organised in the way you want, and you need something like a table or grid drawing, this can be done in permanent marker, which can be easily cleaned off if needed. We also offer several other extras with the glass whiteboard. As we’ve said, the glass is bonded onto a steel back-plate, and you can put this to good use with one of our SAA finished aluminium pen trays which can be attached magnetically. We also have a range of bright coloured high power magnets that can be used on the board in whatever way you need. Overall, glass whiteboards show that normal, plain whiteboards aren’t irreplaceable by a better product. You no longer have to put up with bulkiness and stains on your board, but you can instead replace it with a modern, easy on the eye design.